A care home worker whose jiving with an older resident became a social media sensation, has been recognised with a national award. ‘It makes me feel I’ve chosen the right career path. 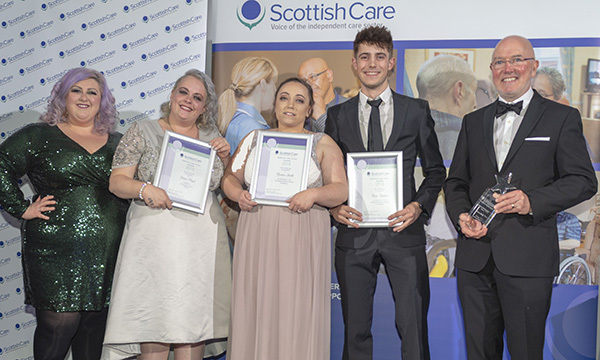 It’s about as rewarding as it gets,’ says Ross Balmer, who was runner-up in the emerging talent category at the Scottish Care Awards, held in November to celebrate the work of staff and organisations in residential care and nursing homes. At the home, where is he now an acting senior carer, he spends most of his time working with the 17 residents who have dementia. They include Yvonne, who is featured in the video, enjoying jiving with Mr Balmer to Elvis Presley’s Hound Dog. ‘She really enjoys her music and loves to dance, and it’s very therapeutic for her dementia,’ says Mr Balmer. Filmed by one of the other carers and uploaded to social media, the video has been watched more than 11,000 times. Looking ahead, he hopes to expand his knowledge of dementia. He also aims to carry on working at the home part-time throughout his studies, gaining even more hands-on experience. Once qualified, he says he would welcome the chance to take up his first nursing post back at the home. ‘It’s been inspirational for me and I gain a lot of satisfaction from caring for people,’ he says. ‘Care homes don’t always have the best image but I really enjoy working here.